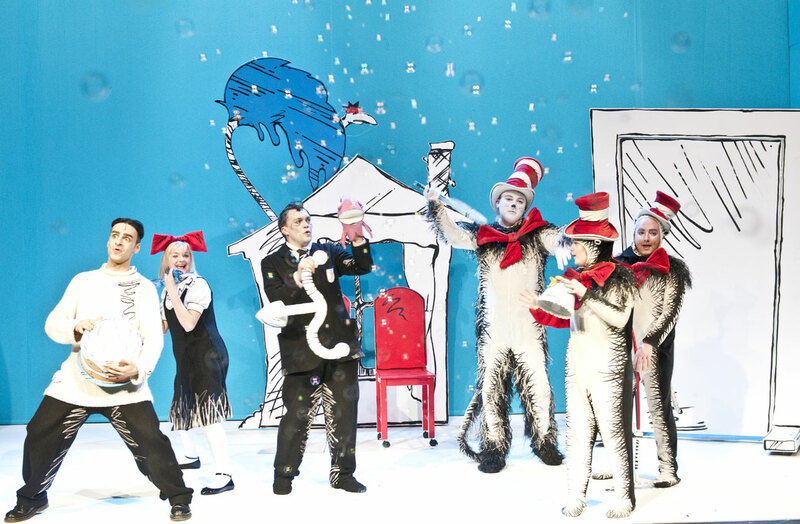 We took our children to see The Cat In The Hat based on the much loved book by Dr Seuss at The New Theatre, Cardiff. The age guidance is 3+ so our children aged 5 and 7 were suitably aged. Two children are fed up on a rainy day, having nothing to do whilst Mum is out, but this doesn’t last for long because a Cat in a Hat suddenly turns up at their house. Their goldfish starts to talk and it just gets a little crazy from this point on. The cat performs lots of silly tricks which I found personally entertaining and certainly appealed to the younger audience members! Two other naughty characters called Thing 1 & Thing 2 then showed up and proceeded to trash the children’s house, and ran around the audience causing chaos. There were balls and bubbles flying everywhere, but finally the troublesome duo were caught and sent away. Luckily there was just enough time to clean up before mum got back. This was a whacky, fun-filled performance full of rhyme, and importantly lets your child use their imagination. The show lasts 45 minutes which is perfect for small ones. Great entertainment. We give it 5 stars.